Flinders Petrie lived in a tent and a basic house at the site from February 4 until June 23rd in relative isolation. He also explored a number of other sites. Petrie notes in the publication that a number of small pottery figures were retained for future distiribution. Petrie, W. M. Flinders 1885-1888. Tanis, 2 vols. Memoir of the Egypt Exploration Fund 2; 4. London: Trübner & Co.
Word for word copy signed ‘R. 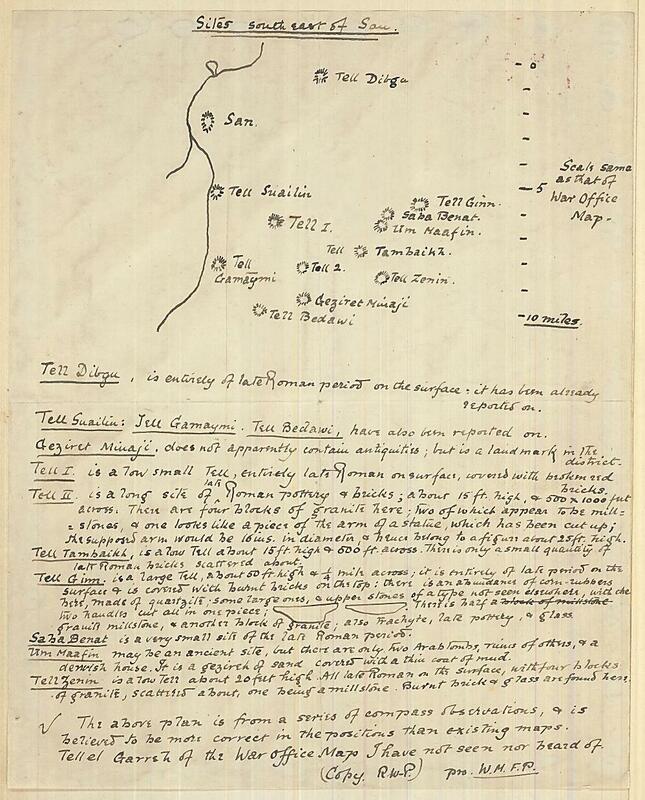 W.-P.’ (most likely Egyptologist Reginald Stuart Poole’s son, Reginald Ward Edward Lane Poole) of a document drawn and written by Petrie, preserved in the Egypt Exploration Society’s Lucia Gura Archive, Correspondence Catalogue COR.EES.XVI.f.28. The original bears a note in the top left hand corner stating ‘received Monday May 5th 1884’ and was part of a progress report sent by the British archaeologist to the War Office and Committee of the then Fund.